Nuclino is a knowledge management and team collaboration platform that enables users from a range of industries to create real-time documents, and connect them instantly like a wiki. The solution helps bring team members together by allowing them to share knowledge via workspaces, visual boards, and documents. Users can work on meeting notes, product requirements, decisions, and other important documents using a collaborative WYSIWYG real-time editor, as well as explore and organize knowledge visually through tree, board, and graph views. Nuclino enables teams to organize and share knowledge in a single, centralized location with tools for real-time collaboration which allow users to edit together at the same time without conflicts or multiple versions of files. As a team member is editing content, collaborators are able to see all modifications as they happen, and have the ability to restore previous versions to undo any unwanted or accidental changes. Content within Nuclino can include text, images, files, videos, tasks, embeds, code blocks, and more. Users can drag and drop media into the WYSIWYG editor, and text can be formatted using Markdown syntax. Users can also organize the team's information into boards and graphs to explore and navigate knowledge using different views and visualizations. Access rights enable users to control which individuals can read or edit files by setting up roles and configuring access settings. Users can create workspaces and clusters to organize items, and use hierarchical tags to organize files into folders or subjects. By typing @ inside any item, it can be linked internally with any other item stored within Nuclino. Users can also search through all files and documents by typing keywords or content into the search bar to find relevant items quickly. Nuclino seamlessly integrates with a number of popular third party apps for communication, diagramming, single sign on, videos, design, development, presentations, and more. Visualization of various knowledge graphs as well as check lists.What I liked the most about Nuclino was the ability to work visually. It's really helpful to be able to structure data in a mind map rather than a list. The real-time collaborative editor helps me work efficiently with my remote team members. Really happy about the release of a Slack integration. Was pleasantly surprised when I started using the tool. Our team needed an easy-to-use wiki/knowledge base to keep track of our projects, store documentation, and collaborate and so far we've been pretty happy with Nuclino. What I liked the most about Nuclino was the ability to work visually. It's really helpful to be able to structure data in a mind map rather than a list. The real-time collaborative editor helps me work efficiently with my remote team members. Really happy about the release of a Slack integration. Was pleasantly surprised when I started using the tool. Our team needed an easy-to-use wiki/knowledge base to keep track of our projects, store documentation, and collaborate and so far we've been pretty happy with Nuclino. Nothing I can think of, it accomplished everything we would expect from a team wiki. A great, slick documentation app. It proved to be an invaluable tool for my team to share information and collaborate on projects.Very easy to use, everything can be structured in a transparent, user-friendly way so it's easier to navigate than folders on Google Drive. The WYSIWYG editor is clean and efficient. Quite affordable too. Very easy to use, everything can be structured in a transparent, user-friendly way so it's easier to navigate than folders on Google Drive. The WYSIWYG editor is clean and efficient. Quite affordable too. This is not really a con more like a feature request, but I wish it were possible to track when stuff gets deleted and by whom. I use Nuclino to document the projects I work on. It serves as a wiki for the project which helps anyone joining the project at later stages understand what was done during the design process, and why certain decisions were made. It is definitely a big step up from using Google Docs and Google Sheets which gets very messy during the course of a project.The way Nuclino is built makes the platform very flexible towards the way you work. The software's very generous free tier lets you explore all the main features. You can even have unlimited teams within the free tier, within which you can have unlimited workspaces. You can think of workspaces as 'projects'. You can then create clusters (think: folders) and items (think: pages). There are 4 views within a workspace: All, Recent, Board and Graph, which is what makes the application great. The Board view is very similar to a Kanban board that even lets you drag and drop 'items' between 'clusters'. Nuclino also has apps for iOS, Android, Windows, macOS and Linux. The way Nuclino is built makes the platform very flexible towards the way you work. The software's very generous free tier lets you explore all the main features. You can even have unlimited teams within the free tier, within which you can have unlimited workspaces. You can think of workspaces as 'projects'. You can then create clusters (think: folders) and items (think: pages). There are 4 views within a workspace: All, Recent, Board and Graph, which is what makes the application great. The Board view is very similar to a Kanban board that even lets you drag and drop 'items' between 'clusters'. Nuclino also has apps for iOS, Android, Windows, macOS and Linux. I felt that the only missing piece to this platform was the inability to set reminders. Pretty simple internal wiki for a company! Not complicated to set up at all! Just sign in and start organizing your data. The free version is generally sufficient for small projects, and the standard version is surprisingly cheap for a small team. It's got a nice and clean notebook like interface, which also serves as your Table of Index to quickly find what you need to. There's also some pretty good privacy settings. You can't control the hosting, and it also requires each member to sign-up to even view your data. For a large team, it can get pretty expensive very fast. It's also not as customizable and feature rich as, say, a custom installation of XWiki (although that's understandably also its strong-point). We've used google docs for some time. In comparison, I feel like the ease of use for nuclino could have been a little more intuitive. 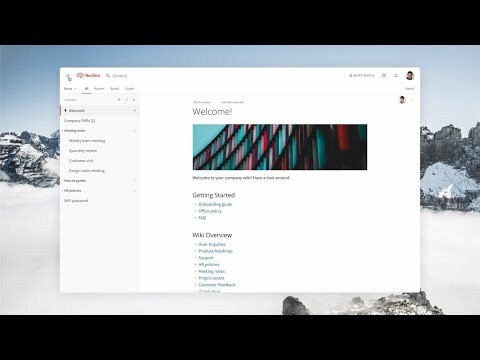 Create and work on collaborative documents in real time and connect them like a wiki. When a team member is editing an item, other users can see their changes as they type. Type keywords into the search bar to find relevant content, and instantly see search results while typing. Users can also switch between results without losing context. Nuclino enables users to work visually by organizing the team's information in different views, such as lists, boards and graphs. All work within Nuclino is automatically saved and synced across all devices, eliminating the need to hit save each time. Users can work from anywhere, on any device. Export all kinds of data from Nuclino in various formats, including PDF and Markdown. Below are some frequently asked questions for Nuclino. Q. What type of pricing plans does Nuclino offer? Q. Who are the typical users of Nuclino? Q. What languages does Nuclino support? Q. Does Nuclino support mobile devices? Q. Does Nuclino offer an API? No, Nuclino does not have an API available. Q. What other apps does Nuclino integrate with? Q. What level of support does Nuclino offer?